This week DOGTV’s Production Assistant, Mike, has decided to take his car – and drive. He wasn’t sure where he was going, but he was really excited to discover where the road will take him. Mike will be travelling for the next few weeks (or months! ), so we’ve asked him to report from the road and share with us his observations about the United States of Dogs. This will be a fascinating journey, so be sure to visit here weekly and get your updates. Bon Voyage, Mike! Road tripping across the United States is as American as apple pie and baseball. The U.S. interstate system makes it pretty easy to just jump in your car and go, well, just about anywhere! Countless books and movies have depicted the cross-country journey in nearly every story imaginable. I’ve had the urge to do a trip for awhile, and maybe you have too. If you have then you’ve probably also thought about taking your four legged friend on the trek. 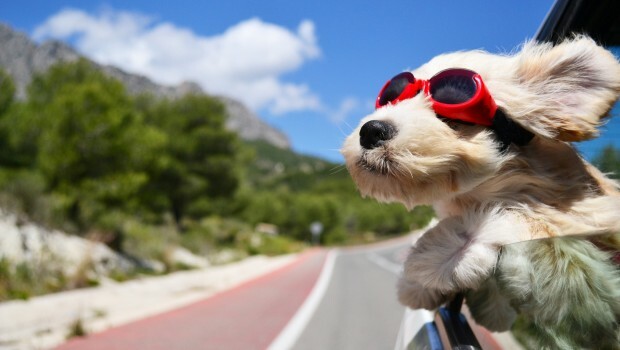 Dogs can love the open road just as much as humans. However, you might have some reservations about how welcoming certain stops along the way will be to your canine companion. That’s where I come in. My name is Mike and I’ll be travelling across the beautiful and majestic United States of America in a car for the next few months. While I do so I’m going to blog about the dog friendliness of each place I visit. I’ll be going to national parks, big cities, small towns, and everything in between. So whether you’re planning a road trip yourself, planning a trip to one of the places I go, or just interested in my journey, then I invite you to follow along.